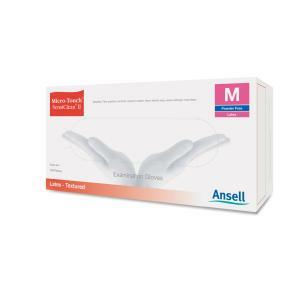 The Ansell MICRO-TOUCH® SensiClean® II latex examination gloves are non-sterile and powder-free with heightened tactile sensitivity and dexterity. They feature a double chlorinated inner surface that's ideal for effortless double gloving while remaining very gentle on fragile skin. The mildly textured surface enables a secure wet and dry grip, while the low allergenicity latex reduces the risk of contact dermatitis due to the absence of thiurams. They're recommended for brief, delicate, low-risk procedures. This long-lasting box contains 100 size M natural gloves.